On April 19, 1967, then-Major Leo K. Thorsness took on, in the words of another officer, "most of North Vietnam by himself" in one of the epic battles of that war. 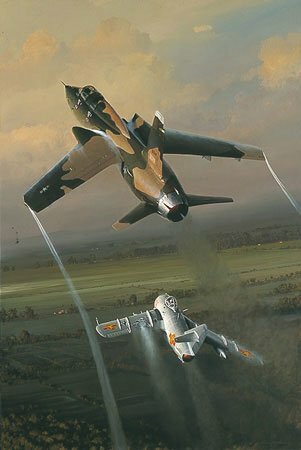 On that day, Thorsness and his backseater, Electronic Warfare Office Captain Harold E. Johnson, fought about a half-dozen MiG's shot down one - and probably another - while protecting their wingman, who, with his backseater, had been forced to bail out of their damaged aircraft over enemy territory. who, we are sad to say, recently passed away.